In the Office of Readings this morning, St Bernard asks us what do we gain from honouring the saints on this feast day. He says the saints are already in heaven so we can offer them nothing. They already see God. St Bernard, a Cistercian or Trappist, who lived in the 12th century, said that the benefit of this feast day is for us because by commemorating those who have gone before us we call to mind the fact that we one day shall also be on our way to heaven. 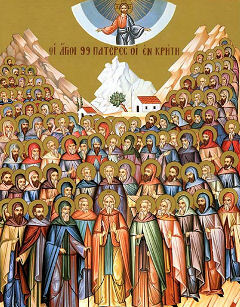 The communion of saints is a lovely teaching of our faith, the fact that we shall all one day meet up and know those we have loved who have gone to heaven before us. It brings life into a sort of long term relationship. What this heaven is like we have no idea but we are guaranteed that we shall see our loved ones and be able to converse with them. There is a beautiful hope in that, a hope that calls to mind a future reality. This memory of the past, our loved ones who have died, and of the future, our own death and hope of heaven, brings our whole life into focus. It recalls the central fact of our faith—that when Jesus rose from the dead that first Easter Sunday morning, we also rose with him; when Jesus rose we all rose as well. This is the belief and hope of our faith. This is the day we celebrate that for the Christian, death is just a new birth and a door to eternal happiness. Now that is worth celebrating!